The 2008 NFL Draft took place at Radio City Music Hall in New York City, New York, on April 26 and April 27, 2008. For the 29th consecutive year, ESPN televised the draft; the NFL Network also broadcast the event, its third year doing so. Of the 252 selections, 220 were regular selections in rounds one through seven, and 32 were compensatory selections, distributed among rounds three through seven. As of the end of the 2018 season, 27 players have been selected to the Pro Bowl. For the first time since the common draft began, no wide receiver was selected in the first round. For the first time ever, the first two picks had the same last name (Jake and Chris Long; they were unrelated). Also, a then-record 34 trades were made during the draft itself. The number of trades was later broken in 2017. The schedule for the draft was changed: day one began at 3:00 PM EDT (1900 UTC), instead of noon, and consisted of just two rounds. Day two began with round three at 10:00 AM EDT (1400 UTC), instead of 11:00 AM. Moreover, the time limits for day one selections were reduced, from 15 minutes to ten for first-round picks and from ten minutes to seven in the second. The limit remained five minutes for all picks in rounds three through seven. The draft also marked the official debut of a new NFL shield logo, replacing the old shield logo which had been used since 1970, featuring eight white stars to represent each of the league's eight divisions, and a football rotated to the same angle as the one on the top of the Vince Lombardi Trophy given to the Super Bowl champion. 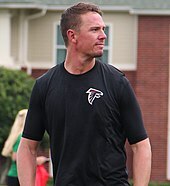 The 2016 MVP Matt Ryan was drafted third overall in 2008 by the Atlanta Falcons. 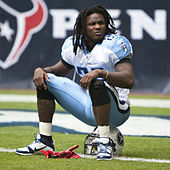 24th overall pick Chris Johnson holds the NFL record for most yards from scrimmage in a single season. In the explanations below, (PD) indicates trades completed prior to the start of the draft (i.e. Pre-Draft), while (D) denotes trades that took place during the 2008 draft. ^ #10: New Orleans → New England (D). See #7: New England → New Orleans above. ^ #19: Philadelphia → Carolina (D). Philadelphia traded its first-round selection to Carolina for Carolina's second- and fourth-round selections in 2008 (No. 43 and 109), and Carolina's first-round pick in 2009. ^ #28: Dallas → Seattle (D). See #25: Seattle → Dallas above. ^ #30: Green Bay → New York Jets (D). Green Bay traded its first-round selection to the Jets for the Jets' second- and fourth-round selections (No. 36 and 113). #34: Atlanta → Washington (D). See #21: Washington → Atlanta above. ^ #36: New York Jets → Green Bay (D). See #30: Green Bay → New York Jets above. #43: Carolina → Philadelphia (D). See #19: Philadelphia → Carolina above. #43: Philadelphia → Minnesota (D). Philadelphia traded its second- and fifth-round selections (No. 43 and 152) to Minnesota for Minnesota's second- and fourth-round selections (No. 47 and 117). ^ #47: Minnesota → Philadelphia (D). See #43: Philadelphia → Minnesota above. ^ #52: Tampa Bay → Jacksonville (D). Tampa Bay traded its second-round selection to Jacksonville for Jacksonville's second- and fifth-round selections (No. 58 and 158) and a seventh-round selection in 2009. ^ #55: Seattle → Baltimore (D). See #38: Baltimore → Seattle above. ^ #58: Jacksonville → Tampa Bay (D). See #52: Tampa Bay → Jacksonville above. ^ #64: Miami → Detroit (D). Miami traded its third-round selection to Detroit for Detroit's third- and sixth-round selections (No. 66 and 176). #66: Kansas City → Detroit (D). See #15: Detroit → Kansas City above. #66: Detroit → Miami (D). See #64: Miami → Detroit above. #69: New England → San Diego (D). New England traded the first of its third-round selections to San Diego for San Diego's fifth-round selection in 2008 (No. 160) and second-round selection in 2009. #71: Jacksonville → Baltimore (D). See #8: Baltimore → Jacksonville above. ^ #76: Detroit → Kansas City (D). See #15: Detroit → Kansas City above. ^ #78: New Orleans → New England (D). See #7: New England → New Orleans above. ^ #84: Washington → Atlanta (D). See #21: Washington → Atlanta above. ^ #86: Seattle → Baltimore (D). See #38: Baltimore → Seattle above. #89: Jacksonville → Baltimore (D). See #8: Baltimore → Jacksonville above. #89: Baltimore → Houston (D). See #18: Houston → Baltimore above. #100: Dallas → Oakland (D). Dallas traded their fourth-round selection (#100 overall) to Oakland for their fourth-round selection (#104 overall) and seventh-round selection (#213 overall). #103: Washington → Tennessee (D). Washington traded their fourth-round selection (#103 overall) to Tennessee Titans for their fourth-round selection (#124 overall), and a fifth-round selection (#157 overall). #104: Oakland → Dallas (D). See #100: Dallas → Oakland above. #104: Dallas → Cleveland (D). Dallas traded their fourth-round selection (#104 overall) to Cleveland for their fourth-round selection (#122 overall), and fifth-round selection (#155 overall). ^ #109: Carolina → Philadelphia (D). See #19: Philadelphia → Carolina above. #111: Detroit → Dallas (D). See #92: Dallas → Detroit above. #113: New York Jets → Green Bay (D). See #30: Green Bay → New York Jets above. #113: Green Bay → New York Jets (D). See #102: New York Jets → Green Bay above. #115: Philadelphia → Miami (D). Philadelphia traded their fourth-round selection (#115 overall) to Miami for running back Lorenzo Booker. #115: Miami → Chicago (D). See #110: Chicago → Miami above. #115: Chicago → Tampa Bay (D). Tampa Bay traded their fourth-round selection (#120 overall) and fifth-round selection (#158 overall) to Chicago for their fourth-round selection (#115 overall) and sixth-round selection (#175 overall). ^ #117: Minnesota → Philadelphia (D). See #43: Philadelphia → Minnesota above. ^ #120: Tampa Bay → Chicago (D). See #115: Chicago → Tampa Bay above. ^ #122: Cleveland → Dallas (D). See #104: Dallas → Cleveland above. ^ #124: Tennessee → Washington (D). See #103: Washington → Tennessee above. #125: Jacksonville → Baltimore (D). See #8: Baltimore → Jacksonville above. #125: Baltimore → Oakland (D). Baltimore traded the fourth-round selection obtained from Jacksonville in Round 1 (#125 overall) to the Oakland Raiders for CB Fabian Washington. ^ #130: New York Giants → Pittsburgh (D). See #123: Pittsburgh → New York Giants above. #136: Miami → Kansas City (PD). Miami conditionally traded its fifth-round selection to Kansas City for Trent Green. The selection would have been upgraded to a fourth-round selection if Green had met certain performance criteria. [source 21] However, Green was injured in a game against the Houston Texans and would up on the injured reserve list for the remainder of the season. #136: Kansas City → Detroit (D). See #15: Detroit → Kansas City above. #137: St. Louis → Green Bay (D). See #128: Green Bay → St. Louis above. #137: Green Bay → Minnesota (D). Minnesota traded their fifth round pick (150) and seventh round pick (209) to Green Bay for their fourth round pick (137). #143: Jacksonville → Dallas (D). Jacksonville traded its fifth-round selection (#143 overall) to Dallas for its fifth-round selection (#155 overall) and seventh-round selection (#213 overall). ^ #150: Minnesota → Green Bay (D). See #137: Green Bay → Minnesota above. ^ #152: Philadelphia → Minnesota (D). See #43: Philadelphia → Minnesota above. ^ #154: Washington → Atlanta (D). See #21: Washington → Atlanta above. #155: Cleveland → Dallas (D). See #104: Dallas → Cleveland above. #155: Dallas → Jacksonville (D). See #143: Jacksonville → Dallas above. #158: Seattle → Jacksonville (PD). The Seattle Seahawks traded their fifth-round selection to Jacksonville for running back Alvin Pearman and the Jaguars' seventh-round pick. #160: San Diego → New England (D). See #69: New England → San Diego above. #160: New England → Tampa Bay (D). See #153: Tampa Bay → New England above. ^ #162: Green Bay → New York Jets (D). See #102: New York Jets → Green Bay above. ^ #163: Seattle → Dallas (D). See #25: Seattle → Dallas above. ^ #164: New England → New Orleans (D). See #7: New England → New Orleans above. ^ #173: Baltimore → Houston (D). See #18: Houston → Baltimore above. #180: Denver → St. Louis (PD). Denver traded their sixth-round selection to the St. Louis Rams for defensive tackle Jimmy Kennedy. [source 26] The trade occurred after the Broncos had tried to trade the same pick to Miami for defensive tackle Dan Wilkinson; that trade was voided. #187: Tampa Bay → Kansas City (PD). The Tampa Bay Buccaneers traded their sixth-round selection to Kansas City for nose tackle Ryan Sims and running back Michael Bennett. ^ #189: Tennessee → Seattle (PD). The Tennessee Titans traded their sixth-round selection to Seattle for defensive end Bryce Fisher. #213: Oakland → Dallas (D). See #100: Dallas → Oakland above. #213: Dallas → Jacksonville (D). See #143: Jacksonville → Dallas above. ^ #233: Jacksonville → Seattle (PD). See #158: Seattle → Jacksonville above. ^ #235: Dallas → Seattle (D). See #25: Seattle → Dallas above. Redskins to Rams. Washington traded fifth-round and seventh-round selections (#157 and #228 overall) to St. Louis for its two sixth-round selections (#168 and #180 overall). Ravens to Texans. See first-round trade above. Steelers to Giants. See fourth-round trade above. Eagles to Browns. Philadelphia traded to Cleveland the 6th round selection they had previously received from the Browns for Hank Fraley (#191 overall). (see Pre-Draft Trades above) In return, the Browns gave the Eagles their 5th round pick in the 2009 draft. Cowboys to Seahawks. See first-round trade above. Raiders to Cowboys. See fourth-round trade above. Cowboys to Jaguars. See fifth-round trade above. Packers to Vikings. See fifth-round trade above. Patriots to Buccaneers. See fifth-round trade above. Baltimore Ravens Jameel McClain LB Syracuse Big East Linebacker in Super Bowl XLVII for winning Ravens. Green Bay Packers J. J. Jansen † LS Notre Dame Ind. (FBS) Long Snapper for the Carolina Panthers, 2009–2014. San Francisco 49ers Brian de la Puente C California Pac-10 New Orleans Saints starting center from 2011-2013, currently a free agent. ^ "Raiders trade Moss to Patriots for 4th-round pick". ESPN. April 30, 2007. Archived from the original on April 5, 2009. Retrieved April 9, 2009. ^ a b c d e f g h i j k l m n o p q r "2008 NFL Draft Trades". April 26, 2008. Archived from the original on April 25, 2010. Retrieved April 2, 2016. ^ Triplett, Mike (April 26, 2008). "Saints trade up, draft Ellis". The Times-Piscayune Greater New Orleans. Retrieved April 7, 2016. ^ a b c d e "Chiefs agree to send Allen to Vikings for three draft picks". NFL.com. April 23, 2008. Retrieved April 23, 2008. ^ Eatman, Nick (April 27, 2007). "Back In". DallasCowboys.com. Archived from the original on January 17, 2010. Retrieved April 28, 2007. ^ a b c Scouts, Inc. (April 28, 2007). "NFL draft trade tracker 2007". ESPN.com. Retrieved April 28, 2007. ^ Wyche, Steve (March 20, 2008). "Falcons complete Hall trade to Oakland". ajc.com. Retrieved March 28, 2008. ^ Pasquarelli, Len (March 22, 2007). "Falcons agree to deal backup QB Schaub to Houston". ESPN.com. Retrieved March 26, 2007. ^ Bedard, Greg (February 28, 2007). "Reports: Packers trade DT Williams to Cleveland for 2nd round pick". JSOnline.com. Archived from the original on March 4, 2008. Retrieved February 29, 2008. ^ Wine, Steven (October 16, 2007). "Chambers headed to Chargers in trade with Dolphins". ESPN.com. Associated Press. Retrieved October 24, 2007. ^ a b Chandler, Charles (April 29, 2007). "Panthers deal Jenkins to Jets for picks". charlotte.com. Archived from the original on May 8, 2008. Retrieved April 28, 2008. ^ Reiss, Mike (April 28, 2007). "Pats trade 91". boston.com. Archived from the original on May 2, 2007. Retrieved April 28, 2007. ^ a b c "Niners forfeit fifth-round draft pick after Goodell finds them guilty of tampering with Briggs". ESPN.com. March 24, 2008. Archived from the original on March 25, 2008. Retrieved March 24, 2008. ^ Smith, Michael; Len Pasquarelli (March 8, 2007). "McGahee traded to Ravens, signs long-term deal". ESPN.com. Archived from the original on May 20, 2007. Retrieved April 28, 2007. ^ a b Glazer, Jay (March 1, 2008). "Jags trade Stroud to Bills for picks". Foxsports.com. Archived from the original on March 3, 2008. Retrieved March 2, 2008. ^ "Dolphins add some Cowboys, acquire two from Dallas for draft pick". CBS.Sportsline.com. Associated Press. April 26, 2008. Archived from the original on February 3, 2013. Retrieved April 26, 2008. ^ Walcoff, Jeff (April 27, 2007). "Browns Trade Again, Get Rucker". clevelandbrowns.com. Archived from the original on May 1, 2008. Retrieved April 27, 2008. ^ Clayton, John (February 29, 2008). "'New chapter' as Vilma dealt from Jets to Saints". ESPN.com. Associated Press. Archived from the original on April 15, 2008. Retrieved April 25, 2008. ^ "Cowboys agree on deal to acquire Pacman from Titans". ESPN.com. April 23, 2008. Archived from the original on April 25, 2008. Retrieved April 25, 2008. ^ Pasquarelli, Len (June 5, 2007). "Green goes to Dolphins from Chiefs in trade". ESPN.com. Archived from the original on October 10, 2007. Retrieved October 24, 2007. ^ "Broncos trade DT Gerard Warren to Raiders". USA Today. USATODAY.com. Associated Press. August 17, 2007. Retrieved November 24, 2007. ^ Pasquarelli, Len (August 2, 2007). "Harris trade adds veteran presence to Panthers' secondary". ESPN.com. Retrieved October 24, 2007. ^ Clayton, John (July 29, 2007). "Bears send fifth-round pick to Bills for Walker". ESPN.com. Associated Press. Retrieved October 24, 2007. ^ Clayton, John (June 8, 2007). "Rams DT Kennedy to help Broncos get bigger on defense". espn.com. Retrieved January 21, 2008. ^ Walcoff, Jeff (September 11, 2007). "QB Frye traded to Seattle". clevelandbrowns.com. Archived from the original on October 21, 2007. Retrieved October 24, 2007. ^ Hixson, Chuck (September 2, 2006). "Cut Down Day Turns Into Trade Day For Eagles". Scout.com. Archived from the original on April 18, 2008. Retrieved May 10, 2010. ^ Ketchman, Vic (February 29, 2008). "Jags nab speedy Williamson: WR gets second chance". Jacksonville Jaguars official website. Archived from the original on March 6, 2008. Retrieved November 29, 2008. ^ Demovsky, Rob (October 29, 2007). "Notebook: Grant emerges from the backfield". packersnews.com. Archived from the original on October 31, 2007. Retrieved November 13, 2007. ^ Pasquarelli, Len (November 17, 2006). "Rams hope Goldberg can fill Pace's shoes at left tackle". ESPN.com. Retrieved May 10, 2010. ^ Coyle, Frank (March 1, 2008). "NFL Draft '08 Traded Picks". Packerchatters.com. Archived from the original on June 6, 2008. Retrieved November 29, 2008. ^ "Walker embraces new challenges with Bills". ESPN.com. March 27, 2007. Retrieved May 10, 2010. ^ "Access Vikings: » Blog Archive » For the draftniks". Ww3.startribune.com. Archived from the original on June 8, 2008. Retrieved November 29, 2008. ^ Legwold, Jeff (March 16, 2007). "Legwold: Plummer may pay $7 million". rockymountainnews.com. Archived from the original on October 27, 2007. Retrieved January 6, 2008. ^ "Eagles trade Fraley, Parry; cut Gaffney, Reed". ESPN.com. September 2, 2006. Retrieved May 10, 2010. ^ Bouchette, Ed (November 14, 2007). "Tomlin vows to shore up deficiencies in kickoff, punt coverage". Pittsburgh Post-Gazette. Retrieved May 10, 2010. ^ "Trade to Giants has worked out well for former Chief Tynes". KansasCity.com. Archived from the original on February 8, 2008. 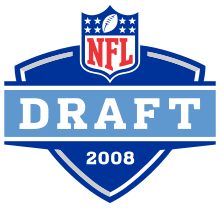 Retrieved May 10, 2010. .
^ "Selection" is the term used in NFL documentation, although the more-commonly used term, and the term used during the broadcast of the draft itself, is "picks". ^ "NFL announces 32 compensatory picks for 15 teams". NFL.com. Associated Press. March 31, 2008. Archived from the original on January 20, 2009. Retrieved January 17, 2009. ^ As there were 32 compensatory selections, there were no supplementary compensatory selections this year. ^ "Teams deal way to record 34 trades on draft weekend". ESPN.com. Associated Press. April 28, 2008. Archived from the original on December 6, 2008. Retrieved November 29, 2008. ^ "NFL Cuts Time Between Draft Picks In First and Second Rounds". NFL.com. October 23, 2007. Archived from the original on December 21, 2007. Retrieved October 23, 2007. ^ Michael McCarthy (August 30, 2007). "NFL to revamp shield with redesigned logo". USA Today. Retrieved November 6, 2008. ^ Miami negotiated a deal with Long on April 22, 2008, four days before the draft. "Miami Dolphins agree to deal with Long, will select OT No. 1 overall". ESPN.com. April 22, 2008. Archived from the original on April 24, 2008. Retrieved April 22, 2008. ^ As penalty for videotaping defensive signals in their season opener against the Jets, the Patriots forfeited their first-round selection since they qualified for the playoffs; they would have lost their second- and third-round selections if they had not. "NFL: 'Spygate' deal in the works with ex-Patriots employee". Philadelphia Inquirer. March 10, 2008. p. E1. ^ San Diego used this pick in the 2007 Supplemental Draft to select Paul Oliver. ^ As penalty for violating the NFL's anti-tampering rules in an attempt to sign Bears linebacker Lance Briggs, the 49ers forfeited their fifth-round selection and were required to swap third-round selections with the Bears. ^ Baltimore used this pick in the 2007 Supplemental Draft to select Jared Gaither. ^ "Wilkinson trade voided, Dolphins retain rights". espn.com. Associated Press. March 31, 2007. Retrieved January 21, 2008. ^ "Florida and Sun". FOX Sports. ^ "Roethlisberger to play against Broncos, Pouncey likely to sit". CNN. January 6, 2012.